The item is suitable for the elderly and families with children, can effectively prevent the elderly and children hurt slipping in the bathroom and other wet environments accident, resolutely put an end bathroom toilet security risks exist. QUALITY MATERIAL : Our bathroom grab bar is constructed with stainless steel material,which is durable,anti-rust,and it features a corrosion-resistant finish to ensure the lasting performance and blends seamlessly.The quality material guarantees the people who uses has a good experience. So do not hesitate to buy one. You may wonder that whether the handle is easy to clean or not,because we all know in the bathroom,there will be much foam and some other wastes may be produced,you may worry about how to clean it. All you need is a clean rinsed cloth and a soap to easily clean it. 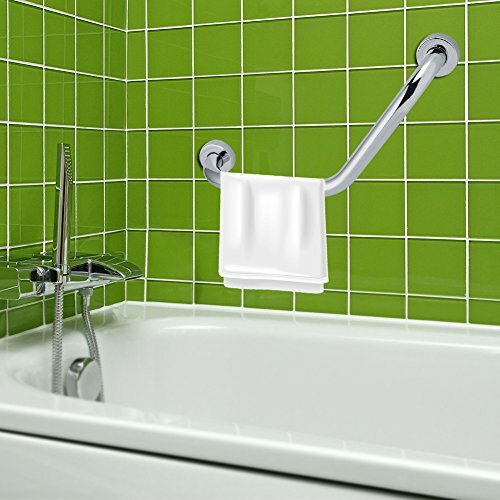 PRACTICAL & CONVENIENT : For the elderly and the children,taking shower in the bathroom is much a difficult thing for them because of the slippery in the bathroom, if not taken good care of ,it might cause great danger.But with our bathroom grab handle,all the problem will be solved for its practical and convenience. MULTIPLE FUNCTIONS : Our safety bathroom grab handle can not only apply to use as Bath Grab Bar, but also can hold clothing,towel, for example,when taking shower,you may need to hang one of your clothes or towels,that's when the handle start to function and so on. EASY TO INSTALL : As an amateur in build up things,the most important thing you may worry is that you can't install it properly.But with our grab bar,your problem is solved by itself ,for the product comes with all the fixing.And the product allows for easy,secure installation at any angle.Installation is the very least thing that bugs you with our product.